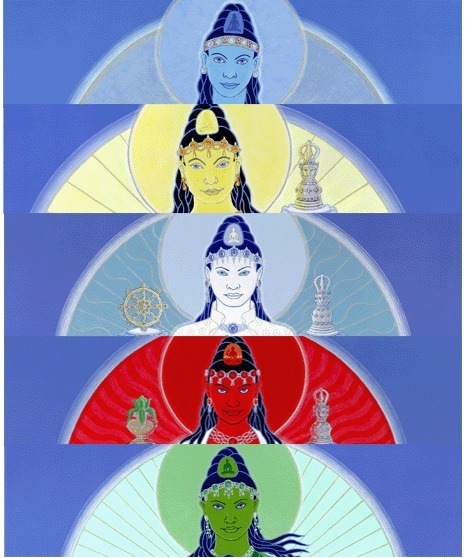 In 2003 I was commissioned to paint the five female Buddhas, representing the wisdom aspect of the five Buddha mandala. These are normally seen as consorts to the male Buddhas, who represent compassion. I finally completed them in 2007, a journey that would have been impossible without the help of others. These female Buddhas have not been drawn out as clearly as the male figures within the five Buddha mandala within the Tibetan Tradition. In his book, "The Five Female Buddhas", Dharmachari Vessantara has specifically given the female Buddhas a place in their own right and his book inspired my creation of the 5 female Buddhas. I studied each of the five female Buddhas in turn and painted them one at a time, whilst at the same time meditating and reflecting on their personal aspects and individual qualities.